In case you’ve missed it, I’ve been banging the drum about OFSTED and their enforcement of “child-centred” education (i.e. low content/ low teacher talk lessons) and how this contradicts the claim by their chief inspector, Sir Michael Wilshaw, that there is no preferred teaching style, and how it contrasts with the comments he’s made suggesting tolerance of didactic teaching (particularly in secondary maths). The difference between the handbook and the subject guidance. Of course, in practice this could mean that inspectors continue to behave in the same way, but leave less evidence of it in the reports they write, but I’m willing to take this as a positive sign that it is realised by Sir Michael that OFSTED’s habit of enforcing child-centred education is not acceptable, even if he does not acknowledge it as common practice rather than a “false impression”. It will be interesting to see if reports continue to complain of too much teacher talk and a lack of independent activities, or even better if we see reports praise traditional teaching where it is done well. As an additional point, even if OFSTED do change, that is of little comfort to those schools who have already been criticised for not conforming to the dumbed down OFSTED model. Among the things I would still be interested in bringing to light are what people have experienced during OFSTED inspections (particularly recent ones) and what type of teaching those inspectors advocated. Please email me if you have a story to pass on. Hardly a false impression when preferred teaching styles are clearly endorsed by Ofsted’s own subject specific advice. One of the issues I have with the current inspection process is how can the Ofsted inspectors really tell if there is progress in learning in a 20/30 minute observation? 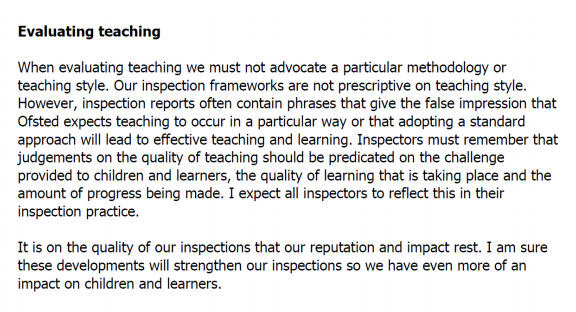 I rather like Wilshaw- and I hope he gets the inspectors to toe the line. David- I must agree with you- you can sometimes tell if a teacher is utterly useless or quite talented in a 10 minute observation. But a genuine appreciation of student progress in a 25 min observation? Nah, pretty much impossible I reckon. One of the problems with that statement is that it is still clearly paves the way for the Inspectors to demand a certain style of teaching. You MUST show progress in those 25 minutes. If no-one is showing progress then game over. Best way to show progress? All that group work Kagany stuff with a mini-plenary every ten minutes to sign post that all the pupils are making progress (even though they probably aren’t). My school has recently been in Special Measures so I have had lots of experience of Senior Management telling me what Ofsted want and they all think that an Outstanding lesson contains all those things that you’ve talked about previously. It’s far too ingrained at a Senior Management level and Inspection level despite what Wilshaw says. His statement above doesn’t preclude it from continuing. I’m not a teacher, but as a parent I find the debate about teaching styles fascinating. The comment about the cult of the “mini-plenary” above reminded me about my son’s comments a couple of years ago when his primary class (Y4) was the “guinea pig” for two teaching candidates’ sample lessons as part of the interview process. Which lesson did you prefer? I asked my son. What was the other lesson about. Wendy- who got the job? As the school has a very good male head of maths, I think it was the non-plenarist! I’d never even heard the term plenary until my son was in Year 2, but recognised the approach from earlier and have seen some teachers use it well. (As an interested parent I’ve been going in to schools since the early ’90s to hear individual readers, and can’t help noticing how lessons are going!) But I can appreciate how irritating over-use is. And repeatedly holding up examples of pupils’ work during a lesson can be demotivating to others – the opposite of the desired effect.